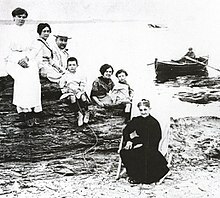 The Dalí family in 1910: from the upper left, aunt Maria Teresa, mother, father, Salvador Dalí, aunt Catherine (later became second wife of father), sister Ana Maria and grandmother Ana. Wild-eyed antics of Dalí (left) and fellow surrealist artist Man Ray in Paris on June 16, 1934. স্বাক্ষৰিত আৰু সংখ্যাকৃত ভাস্কৰ্য 5/8. Bronze with dark patina. আকাৰ: 388 x 210 x 133cm. ↑ "Phelan, Joseph, ',The Salvador Dalí Show". Artcyclopedia.com. http://www.artcyclopedia.com/feature-2005-03.html। আহৰণ কৰা হৈছে: August 22, 2010. ↑ Saladyga, Stephen Francis. 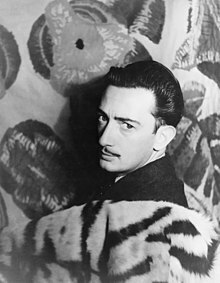 "The Mindset of Salvador Dalí". lamplighter (Niagara University). Vol. 1 No. 3, Summer 2006. Retrieved July 22, 2006. ↑ "ভূপেন হাজৰিকাৰ জনপ্ৰিয় গীতৰ অনুপ্ৰেৰণা ডালিৰ বিখ্যাত ছবি". http://www.assamkart.com/new-releases/178/2/assamese/%E0%A6%8F%E0%A6%95-%E0%A6%A7%E0%A7%80%E0%A6%AE%E0%A6%BE%E0%A6%A8%E0%A7%B0-%E0%A6%9C%E0%A7%80%E0%A7%B1%E0%A6%A8%E0%A6%AA%E0%A6%9E%E0%A7%8D%E0%A6%9C%E0%A7%80-%28Ek-Dhimanor-Jeevanpanji-detail। আহৰণ কৰা হৈছে: নৱেম্বৰ 23, 2013. ↑ Birth certificate and "Dalí Biography". Dalí Museum. Dalí Museum. http://www.salvadordalimuseum.org/history/biography.html। আহৰণ কৰা হৈছে: August 24, 2008.